Saxifraga is the largest genus in the family Saxifragaceae, containing about 440 species of Holarctic perennial plants, known as saxifrages. 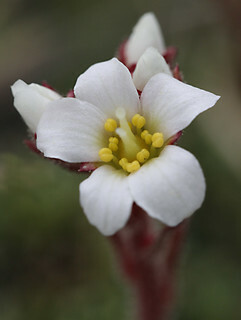 The Latin word saxifraga means literally "stone-breaker", from Latin saxum ("rock" or "stone") + frangere ("to break"). It is usually thought to indicate a medicinal use for treatment of urinary calculi, rather than breaking rocks apart.